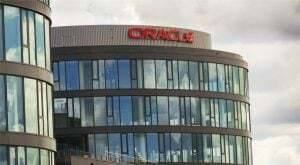 When Wall Street thinks of the companies leading the migration of computing off local servers and onto the global cloud, Oracle Corporation (NYSE:ORCL) is not very high on that list. But now that the database giant has started aggressively shifting its Fortune 500 customers to cloud relationships, it’s time prominent early players like Amazon.com, Inc. (NASDAQ:AMZN), Microsoft Corporation (NASDAQ:MSFT) and Alphabet Inc (NASDAQ:GOOG, NASDAQ:GOOGL) start watching their backs. All ORCL needs to do is push the button to start converting customers to its cloud. The company has built out a massive data network and will keep scaling it up to meet user demand — last quarter’s capital expenditures close to $600 million indicate just how fast management expects that demand curve to ramp. And they’re not exactly throwing that cash into a hole and hoping it will eventually hit profit, either. Gross margins on the existing cloud operations are well above 40% at this stage. By year-end, they’re looking for efficiencies of scale to double that margin. I believe the ultimate weapon is ORCL’s sprawling base of installed users. Even a brief list of the companies currently tiptoeing around migrating to the ORCL cloud reads like a tour of the Fortune 500: big banks, big manufacturers, big government and even big cloud itself. AMZN runs its internal business on ORCL cloud systems, boosting its spending in $50 million increments as its dependence on this platform grows. SAP SE (ADR) (NYSE:SAP) runs its databases on ORCL servers, and so does Salesforce.com, Inc. (NYSE:CRM). With roots that deep in the competitor camp, CEO Larry Ellison’s people don’t really need to spend much time chasing end-level accounts. As long as Amazon, SAP and Salesforce grow, Oracle stock grows with them. However, that doesn’t mean the company is going to snub those end-level accounts. Management is explicitly gunning for Amazon’s $20 billion cloud business. They’ve promised that anyone who migrates will cut their cloud bills in half when they change platforms. And in some cases, they’re willing to charge just 20% of what AMZN takes now. This is a very compelling sales proposition, especially for customers who already have one foot in ORCL’s universe. While aggressive discounting plays against short-term profitability, those that switch are extremely loyal. So far, 80% of Oracle cloud revenues have renewed for longer periods, locking in the business for the company and keeping it away from big-tech rivals. The fact that even Amazon can’t decouple its internal business from a bloodthirsty competitor speaks to the retention story here. Once you go ORCL, you don’t go back. The real stinger is that ORCL started pushing the button to convert these accounts back in January. The migration has already started, and we’ll see the initial results when the company reports the current quarter in mid-March. With the “slow” parts of Oracle stock’s operations growing 20% a year, I believe the fundamental needle will start moving a lot faster in the next few quarters. ORCL has almost built a $6 billion cloud business in the last few years, leapfrogging above GOOGL and moving into position to pass International Business Machines Corp. (NYSE:IBM) in the foreseeable future. Simply converting existing captive customers should give investors an invigorating ride. As it is, ORCL looks cheap relative to that untapped growth. The price potential is huge — even bringing healthcare to the cloud puts $3 trillion a year into play — and management has their eyes fixed on that prize. Hilary Kramer is the editor of GameChangers, Breakout Stocks, High Octane Trader, Absolute Capital Return and Value Authority. She is an accomplished investment specialist and market strategist with more than 25 years of experience in portfolio management, equity research, trading, and risk management. She has extensive expertise in global financial management, asset allocation, investment banking and private equity ventures, and is regularly sought after to provide her analysis on Bloomberg, CNBC, Fox Business Network and other media. Article printed from InvestorPlace Media, https://investorplace.com/2018/02/oracle-corporation-orcl-stock-cloud-prominence/.